How Duplicitous was James Murdoch's Donation? 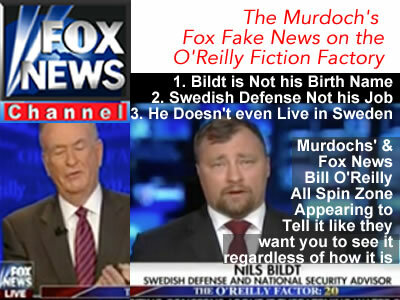 How Racist the Sly Fox (News)? Is Racist Reporting done on Fox News? Click here to CONTINUE - Is Fox News Sensationalizing by Racial - izing? Updated September 3 / August 28, 2017 / NYC Neighborhoods / NYC Government & Politics / News Analysis & Opinion / Gotham Buzz NYC. Continued. 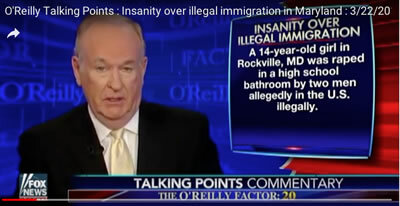 Hannity & Obama Birthers: Is Fox News a Platform for Racism? The second example of what might be construed as Fox News racism, was Murdoch Mouthpiece, 'Super Slick' Salesman Sean Hannity's coverage of a sensationalist court case in Ohio. In 2009 a military reserve volunteered to go to Afghanistan and then changed his mind. Instead of going through normal channels to have the orders changed, he decided to go to court instead, claiming he wasn't going to go to Afghanistan because Obama wasn't born in America, and hence was not a legitimate president. "Fox News had added legitimacy to the irrational and baseless conspiracy-theorist "birthers" who continue to insist, despite evidence to the contrary, that Barack Obama was not born in the United States and [is] thus an illegitimate president. One such effort came from Sean Hannity, reporting on a soldier challenging his deployment to Afghanistan on the grounds that Obama is not eligible to be president. Hannity had failed to note in his report the availability of Obama's birth certificate and how the birther claims have been completely investigated and debunked. Hannity gave an update to the Afghanistan story last night (July 15, 2009) and took it a step further by suggesting, along with the plaintiff, that the subsequent revocation of the soldiers [sic] deployment orders indicated that his allegations were proved true. But Hannity omitted key details that point to a scam by the soldier. ... Had Hannity bothered to do the simplest of Google searches, he would have also uncovered this key piece of information from that day's Georgia Ledger-Enquirer [sic] newspaper.... So, Maj. Cook filed a request to serve the Commander-in-Chief in Afghanistan on May 8, well after Obama had assumed the presidency, but now, about two months later, is claiming that Obama is not qualified to be president. And instead of going through the administrative process to revoke his orders, which would seem to be a pro forma matter, he sued in federal court." "After the lawsuit was reported in the Columbus Ledger-Enquirer, the newspaper reported receiving "the highest volume of traffic ever by a single story in the history of ledger-enquirer.com, including written threats against the newspaper", with nearly half a million new readers and hundreds of e-mails." "Cook received significant media coverage on July 16, 2009, from Fox News's Sean Hannity." The judge dismissed the lawsuit, but 'Super Slick' salesman Sean Hannity's sensationalist fake news coverage likely enriched him and the Murdochs via a spike in TV ratings. This wasn't the first time that Hannity exploited a story to win him and his boss cash-rich ratings, and it wouldn't be the last time either. Remember Hannity and Fox are the same ones who pushed the WMD story HARD in the push for the Iraq War [scroll down to headline 'Mr. Murdoch's War']. Fox Fiction Factory: Pseudo Newsman Hannity? Is Two-Time College Drop Out Hannity a Phony Anchorman? Hannity insists he's no journalist, yet Fox seems to create the pretense that he is one by 1) the way they dress him, 2) the way they seat him in an anchorman-like chair, 3) by placing him what looks like a TV news set and 4) by adorning his broadcasts with all sorts of the 'Fox News' emblazoned on the screen. 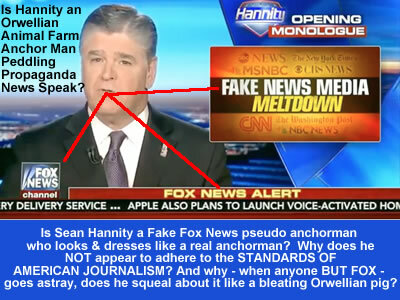 So while Hannity insists he is not a journalist - it appears he wants to visually fool us into believing that he is one. I suspect that the reason Hannity doesn't call himself a newsman is because he doesn't want to be held to the standards of American journalism. He appears to be a phony anchorman who wants to have it both ways by looking like a newsman, while reporting events however he wants. Hannity's news distortions, at times bordering on fiction, often enough appear to misinform his audience. An apt analogy might be a guy who can do surgery-like operations who pretends he's a real surgeon, who then removes your liver instead of your spleen. In any case it seems the Hannity newsman deception is complete as during a recent [August 2017] broadcast, alleged racist Sheriff Joe Arpaio called Hannity a journalist, a statement which Hannity did not correct, like he has corrected other journalists who begin to question his reporting procedures and ethics. The problem is that the distorted reporting done by the Super Slick Propagandist Salesman Sean Hannity is seen and heard by millions of viewers and listeners nearly daily. 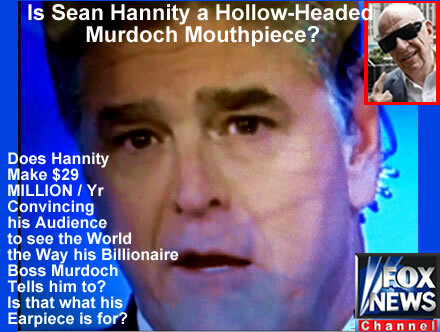 Hannity provides them with a Murdochian manipulated view of the world, that often enough is at odds with the truth. This is all too similar to what the Nazis did with their propaganda - they mass produced managed perceptions in an effort to manipulate and then maneuver their audience. 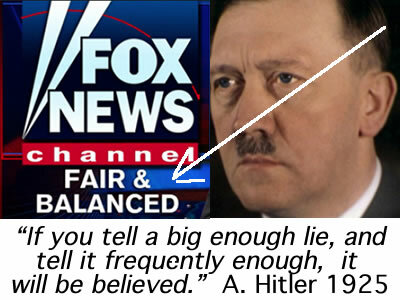 Both Hannity and the Nazis seem to cheat their audiences of the truth, and when people make decisions based on a false set of facts, they inevitably get screwed. 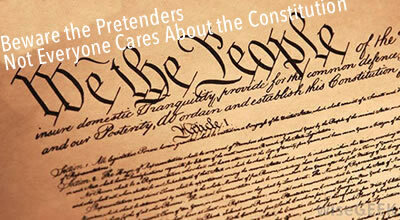 Unethical Journalists aka Propagandists are like Unethical 'Super Slick' Used Car Salesmen. They distort the truth in order to profit. Remember it was Hannity & Murdoch who sold us the Iraq War based on phony weapons of mass destruction. They both appear to have profited from the Iraq War because of the immense increase in cable news ratings. Meanwhile America's parents, spouses, siblings and children were stuck coping with lost loved ones, lost limbs, trauma and with a trillion plus more of national debt. 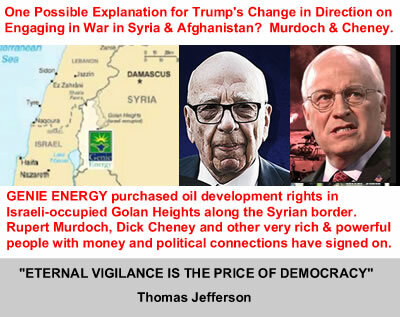 And Murdoch, Fox and Hannity appear to be preparing us for more war, with Korea or in the Middle East or wherever, as these guys appear to be potential beneficiaries of a Trump presidency [see details below], which is likely why - according to Business Insider - James Murdoch did not even single out Trump by name [said president]. It's worth noting that Sean Hannity is reportedly a two-time college drop out [NYU & Adelphi], which might help explain why it appears he does not want to be held to the standards of American Journalism [maybe he doesn't know what they are] as well as that he probably doesn't like to do his homework which seems apparent in so many of his broadcasts that I've watched. As noted in the report above, all too often key facts are missing from his propagandist reports, and he doesn't appear to bother himself with verifying his sources or checking his facts. Hannity reportedly has an income of $29 million per year, multiple multi-million dollar homes, and he travels around in a private jet, staying at luxury hotels and eating at the best restaurants. So it looks like phony newsmen, pseudo anchormen get paid well to deceive his fellow countrymen into believing what appear to be Rupert Murdoch's self-interested managed perceptions of the world. Masters of Deception: Like Father, Like Son? Did Murdochs pay $350 Million in Legal Fees to Escape Justice? The Murdochs' Fox News, like Hannity, appears to be willing to do anything for ratings, no matter what the impact on other peoples' lives. In point of fact, it seems to be the ethos of the Murdoch media culture. Rupert and James were at the helm of the News of the World, during what appears to have been about a decade long of organized, illegal phone hacking of about 5,000 phones by people working for their organization. During this time, the Murdoch's organization reportedly used the voicemails from the phone of a murdered girl and / or her mother, to exploit their privacy and sensationalize exclusive headlines related to the girl's murder. They caused the mother great pain and were compelled to pay the mother millions for exploiting her anguish, but I imagine that the value of her legal settlement was worth far less than the revenue the Murdoch organization made on their headlines. 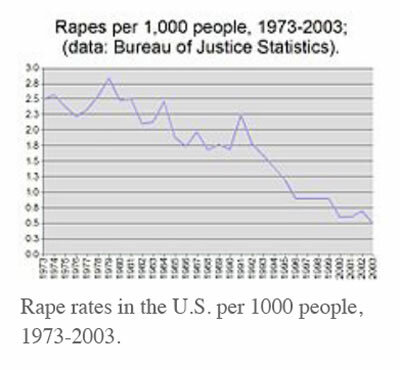 That's not justice. "In May 2012, a highly critical UK Parliamentary report said that Murdoch "showed wilful ignorance of the extent of phone-hacking" and found him "guilty of an astonishing lack of curiosity" over the issue. It went on to say that both Murdoch and his father, Rupert, 'should ultimately be prepared to take responsibility' for wrongdoing at the News of the World and News International." Does Murdoch's organization exhibit brutal, mob-like characteristics to win coveted ratings? Is winning higher ratings at any cost, the core ethos of the global Murdoch media organization? 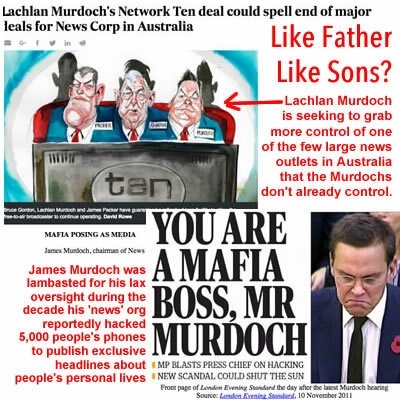 I've been watching the Murdoch foxes over the past year, and one of the narratives I hear repeated in the Main Stream Media and parrotted by some of their audience, is that the next generation of Murdochs will manage things differently than their father. The Murdochs seem to want to convince us to believe that the next generation of Murdochs will make Murdoch's Fox & media empire more 'fair & balanced'. But so far, all I've seen is that the next generation of Murdochs appears to be behaving just like their father. They seem to use what appears to be their father's deceptive practices of mass market media manipulation, and to continue his work changing / circumventing laws to accumulate even larger shares of market power. 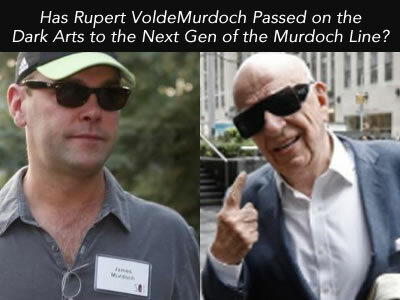 For example Rupert's son Lachlan is leading an effort to accumulate more share in the Australian TV market that the Murdochs already fully dominate. I'm sorry for not going along with what appears to be a load of self-serving Murdochian propaganda, but the narrative that the next generation of Murdochs will be different does not seem to be in alignment with the facts. Breaking with Republicans & Democrats to Build a Fox Nation? As alluded to above, many of the mainstream media outlets reported James Murdoch's ADL donation and some appeared to interpret it as a change in direction at Rupert Murdoch's 21st Century Fox / Newscorp. 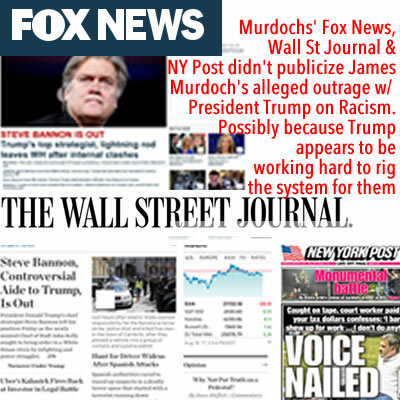 The Murdochs control Fox News, the Wall Street Journal and the NY Post - all of which are part of Murdoch's propaganda machine - which provided massive, unrelenting, media support which helped put Donald Trump into the presidency. The Murdochs' propaganda machine appears to be continuing their support him not just in opposition to the Democrats, but also in opposition to Trump's and Murdoch's own Republican party. This has some parallels to how Murdoch fought for - and then seemed to manage / manipulate former Australian Prime Minister Tony Abbott. The Murdochs supported a former employee [Tony Abbott] bid to become Australian Prime Minister and he won. But Abbott was replaced by his own party after causing too much of a stir and appearing to work too hard in Murdoch's favor. Pay heed. Fox Nation? 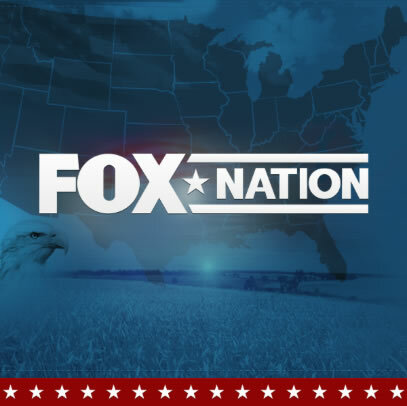 Perhaps the 'Fox Nation' logo doesn't mean Fox National News, so much as it's telegraphing the Murdochs' intent to conquer the nation. The Murdochs appear to have all but conquered Australia where the Murdochs have a near monopoly share of media, and most times the man they support for Prime Minister wins. The NYT's hints that this is a Murdoch family 'change in direction' doesn't seem to square with the facts, given that Rupert Murdoch himself was given the ADL Leadership Award in 2010 for his support of Israel [so a gift by James Murdoch doesn't appear to indicate any change per se] and that none of the primary Murdoch controlled news outlets reported James Murdoch's donation. This hypocrisy [watch my token gift - not what I print and broadcast] was also not unexpected given the skew of Murdoch organization reporting. 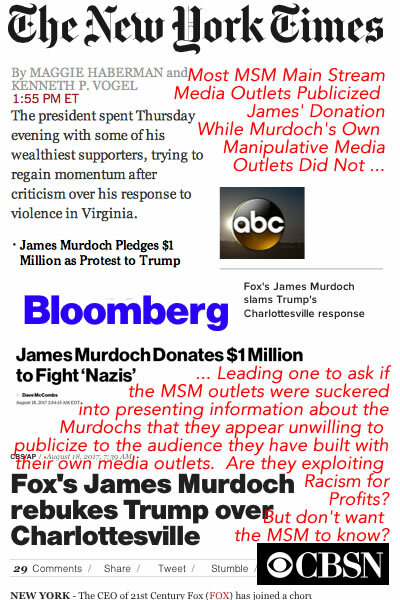 I monitored the Murdoch print, broadcast and web media pretty closely following the James Murdoch's donation announcement - and to the best of my knowledge, Fox News, the Wall Street Journal and the NY Post didn't print or broadcast anything about James Murdoch's gift. The Murdoch's appear to be managing the Main Stream Media perception of them, by highlighting the donation and hinting at 'changes', while keeping their own audience in the dark about it. They appear to be as effectively propagandistically manipulating the Main Stream Media owners / editors as they appear to manipulate their own audience - by providing a believable narrative along with a very selective presentation of the facts. They've been doing this here for years and not until recently has Main Stream Media management demonstrated much awareness of it / showered much attention on it. As mentioned previously, the Murdoch's propaganda machine seems to function like the well-oiled Nazi propaganda machine did, by managing their different audiences perceptions, and only telling them what they want their audiences to hear. It seems both generations of the Murdoch's - are masters of deceit and manipulation - not only of their audience but also of many of their peers. So much for the New York Times advertisement of 'insightful' reporting. Sensationalizing by RACIAL - izing? If James Murdoch Wants to Fight Racism & Anti-Semitism, Why Did He Sanitize the News on his Own Outlets? Why Didn't James Murdoch Use his own News Outlets - Fox News, Wall Street Journal & NY Post to Send the Message he implied by the ADL Donation? As mentioned above, notably absent in reporting James Murdoch's donation to the Anti-Defamation League were the news outlets controlled by James Murdoch and the Murdoch family including Fox News, Wall Street Journal & NY Post. This is based on my perusal of the websites that day and in subsequent days and from search results over the following week. Like hypocrites Hannity & O'Reilly, it appears the Murdochs also want to have things both ways. Meaning that they appear to want to have the Main Stream Media lead their audiences to believe that the Murdochs abhor racism, even as the Murdochs' own news organization appears to be benefitting from the exploitation of racist themes and racist appearances at their own 'news' outlets. 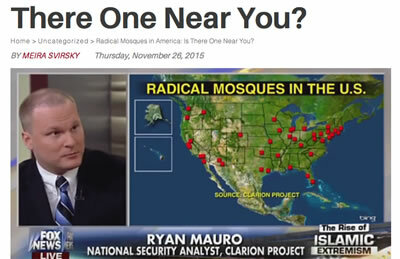 Fox News: Sensationalizing by RACIAL - izing? The Murdochs appear to be profiting from this repugnant, culturally-biased storytelling, as it appears to attract a sensation seeking news audience. Sensation seeking newsers appear to be an audience that is more susceptibe to believing things - even if they are not true. Click here for a prior report we did that includes a list of seven studies showing that the Fox News audience is more likely to be disinformed - sometimes more disinformed than those who don't regularly watch any news. These studies are listed near the end of the story, just above V under the headline - FOX: A Disinformation News Source?. Hitler made a reference to having a gullible audience, prone to believing anything told them, with his famous BIG LIE quote. I'm extrapolating here, but it seems that the lies are made more sensational and more believable if you're exploiting the prejudices toward a weaker minority - which in Hitler's case, were Germany's immigrants of the time - the Jews. The advantage of having a sensation-seeking gullible audience is that the Murdoch propaganda machine then appears to 'prepare' their audience for Murdoch electoral recommendation via distorted and sensational reporting on the Murdoch news / propaganda outlets. Oftentimes it appears the Murdoch organization instructs their manipulated audience into voting in favor of candidates who will favor the multi-billionaire Murdochs' interests - which often enough appear to come at the expense of the interests of the audiences they appear to be deceiving. The Iraq War and the fake news of Weapons of Mass Destruction is a good example, as is the assertion that there is no climate change - which goes against the findings of the scientific community, and I suspect the Trump tax cuts are going to be another billionaire giveaway at the expense of America's children and middle income / working classes. Here's a link to a prior story I did which outlines what I believe are more more than three decades of coincidences of Murdoch support followed by what appear to be government favors - Murdoch Fox News Corruption ? And there's more potential giveaways noted below relative to the current presidency. Please keep this brief account in the back of your mind, while you're watching the next generation of Murdochs take the public stage to inform ... or disinform you. Trump Presidency: Murdoch Windfall Benefits? The Murdoch organization appears to already have been a big beneficiary during the first seven months of the Trump presidency. 5) appears committed to rolling back important, hard-fought regulatory protections - including FCC Rulings of American media - where Murdoch is again in talks to expand his ownership concentration of U.S. news outlets. 6) appears committed to eliminating tax on billionaires' childrens' inheritances. They call it the 'death tax' but it's really a tax on the extraordinary unearned income of some of the richest and most pampered kids in the world. What is the social value of eliminating this sort of tax on the new mega-millionaire / billionaire American royalty, when people who have difficulty paying their rent, are paying taxes are their hard earned income? If only a few people control the city, state and national communications companies, the rest of us will never be heard. Australia has nearly capitulated as the Murdochs control a monopoly share of the newspapers there, as well as the dominant satellite TV operation. The Murdochs' financial and operational tentacles reach into nearly every other major Australian TV operation and they are in a bid to take collaborative control of one of the remaining independents. During WWII the Germans rolled into nations with similar cultures first - starting with Austria, the Sudentland in Czechoslovakia and Prussia in Poland. The Murdochs appear to be employing a similar expansion strategy with their media empire. And while Nicolo Machiavelli would likely approve of this strategy - our American Founding Fathers would not. The Murdoch quest for monopoly shares of media is an affront to our democracy and democracy everywhere. The Murdochs control a dominant share of newspapers in Britain [about 35% including two of the top three newspapers in Britain - The Sun & The Times of London], and if successful with the Sky TV takeover, they will likely soon control the largest commercial TV operation in Britain. While it will be second in audience to the BBC, the BBC is limited in its political coverage by virtue of its funding from the government. And the current second place British TV Network, ITN, has only a slightly greater than the combined Fox / Sky merged entity would have. But the Murdochs would likely leverage the dominance of their newspaper assets to quickly surpass - if not crush their competition. 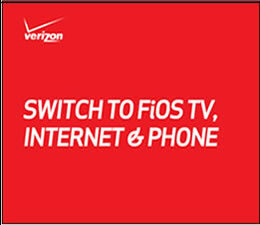 In America the Murdochs dominate the NYC metro market as they control the NY Post, the Wall St Journal, the Fox TV Network as well as Two NYC TV stations - Fox 5 and WWOR Channel 9. 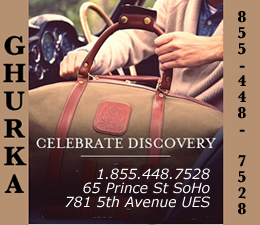 The Murdoch media holdings also include nearly a couple dozen local TV stations, as well as numerous other media brands including Barron's, National Geographic & Harper Collins, which together makes them easily one of the few top players in the U.S. media market. Many laws were changed to make Murdoch's concentration of NYC media possible, and with Trump in office, Murdoch appears intent continuing his efforts bend government rules and regulations to his will, so he can continue his quest for media dominance on a national and global scale. You can help this small independent website operator by donating at the bottom of this page, to keep an insightful and independent press alive in America. News sites and newspapers don't make money like they did in the past. And you're not obliged to pay for access like things used to be. Even small donations help, in as much as they tell us there are people out there who also care.